When it comes to golfing, there is often the discussion about whether or not you should choose to go with spiked golf shoes or spikeless golf shoes. Luckily, we’re here to compare the two and help you come to a decision. One big point of comparison is the amount of traction that either shoe possesses. Traction is an important part, as not having proper traction can hinder and potentially ruin your swing. Spiked golf shoes have the obvious edge here. With the spikes planting into the ground, you won’t have to worry about suffering negative effects from any sort of traction, as your foot will be firmly planted into the ground. Another big aspect that helps spiked golf shoes edge out spikeless in this category is weather conditions. Should it be rainy or muddy, then you’ll have better luck not losing your footing with spiked golf shoes. However, spikeless golf shoes are quickly advancing technologically to provide nearly the same amount of traction that spiked golf shoes do. Yet, it appears that spiked golf shoes win in the category of traction. If you are on the golf course for a large majority of the day, you will want to be there comfortably. The last thing you want to do is spend the day in pain and agony walking from hole to hole. Spikeless golf shoes help provide the extra amount of comfort that spiked golf shoes can’t. With nothing in between you and the ground, there is more potential for companies to create more comfortable soles for the shoes. If you are a new golf player, you may be looking at this article for guidance as to what style shoe better suits you. When asked which is better for a novice player, many golf coaches and players agree that you may want to go with spiked golf shoes. The advice to go with spiked golf shoes comes from that fact that a large part of the game of golf revolves around having a firm, planted, and locked-in swing. 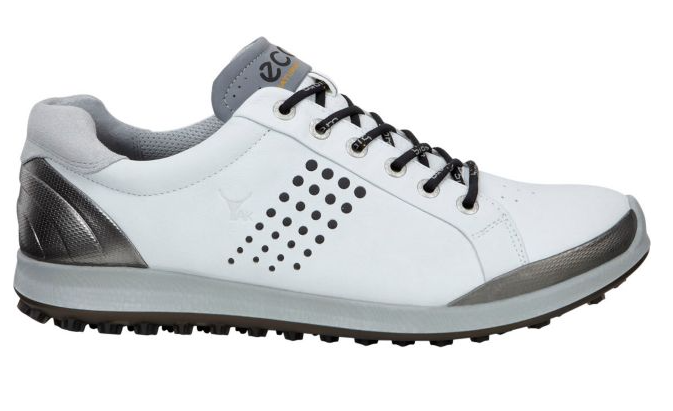 Spiked golf shoes allow for the conditioning of this easier as your feet will be more firmly planted. So now that we have covered what choice beginners should go with, what do type of golf shoes do the professionals choose? As many of them had originally trained using spiked golf shoes, a large majority of them continue to use them. They often find they have better control of their swings and the spiked option helps them play better. However, more recently, more and more pros are switching to the spikeless golf shoe option. They are claiming they find them more comfortable and enjoy playing in them more. Yet, the winner in this category is still spiked golf shoes by a large margin. After reviewing categories such as traction, comfort, the best option for beginners, and the choice of the professionals we can come to a verdict. While there are positives and negatives to either option, it is safe to say we can narrow them down to one winner. It appears that the general consensus is that spiked golf shoes are the better option when it comes to traction control, for beginners, and the choice of the pros. With them being able to provide better control of a player’s swing, they are the seemingly obvious choice. On top of that, they seem to be able to be the better choice for players no matter the weather condition or ground type. Yet, that doesn’t mean that spikeless golf shoes are a bad option. With new technology constantly coming out, spikeless golf shoes are becoming more and more advanced and better to play with. At this rate, it will not be long until spikeless golf shoes are on par with their spiked counterpart. A large part of this argument comes down to personal preference. You may try out spiked golf shoes and realize that they are not the best option for you. Thankfully, there are more than one option for each and every golf player out there, beginner or professional.